Our first club Time Trial of 2016 will take place on Tuesday 29th March. This will be the 1st of 3 events throughout the year. The event is open to all and held over a 5km course. Competing in these events is a great way of tracking your progress throughout the year. Entry is free, with food (pie and peas) served in the clubhouse afterwards for a fee of £2. Eric will be holding a session on the grass at the Cricket Club on Tuesday 22nd March. This is open to all – why not give it a go?! The first Registration evening will be on April 5th and the second will be April 14th. Please arrive at training a little earlier, especially on the 5th, to allow Eric to process registrations. At registration, we will require Name, Date of Birth, Signature and £13 to cover up to 5 races. Please pay by cash or cheque (made payable to ‘Knaresborough Striders’). Please be aware you must have paid the individual England Athletics fee to compete in these runs. Andy Robinson (Membership Secretary) can advise on your current EA status. For further information, please see Eric at Club training on Tuesday March 22nd. It was a glorious weekend for running, with the Spring sunshine finally deciding to make an appearance for the 21 Striders taking on events. We have scoured the internet for results of events we know about, but if we have missed any out, please let us know via info@knaresborough-striders.org.uk. Starting with parkrun on Saturday morning, the Striders were represented at three events. At Harrogate, Guy Close was the first Strider to collect his finish token, completing the course in 19:54. Next back were Nicola Carter and Ian Mitchell, who were split by only 1 second, finishing in 22:04 and 22:05 respectively. They were joined on the Stray by Gareth Conkleton (24:13), Anthony Everitt (28:02), Andrea Price (28:12), Rob Charlesworth (28:43), a PB securing Joanna Simpson (30:20) and Emma Greveson (34:33). At Fountains Abbey, Andy Robinson led home the Striders contingent of six with a PB time of 19:16. Jonny Chadwick had a solid run to notch a 22:45, and he was follows by Gemma Harding (25:18), Natalie Hale (30:04), Alison Jackson (30:09) and Irene George (31:06). At Horton Park in Bradford, Tracy Allison finished with a time 29:33. 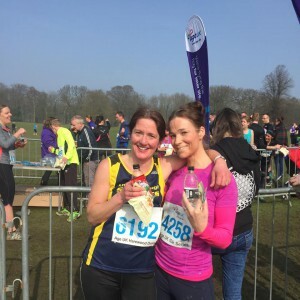 A 10k, A Marathon and an Adventure Race – Striders branching out into lots of different events! The challenging Harewood House 10k was held on Sunday morning. This is a tough multi terrain course, with the final 1km up hill which gives the legs a real test to get over the finish line! Lucy Cartwright was the first Strider across the line, finishing just over the hour mark with a 01:01:07. Nor far behind was Joanne Fowler (01:02:00) and Bill Kirkpatrick finished his 2nd consecutive weekend of racing with a time of 01:06:20. On Saturday, Graham Yare finished 5th in the ‘Liverpool to Leeds Canal Canter Marathon’, based at Kirkstall Abbey, with a time of 03:42:10. A little further afield, new member James Warburton competed in the Kilarney Adventure Race in Ireland. This is a gruelling, multi-discipline, 55km event consisting of a 20km Cycle, 14km trail run, 11km Cycle, 1km Kayak and a final 9km Cycle. He finished on the podium, taking 3rd place with a time of 02:32:49. The Mob Match is an annual competition with our local rivals Nidd Valley where we race against them within the Burton Leonard 10k. 2016 is the third year of the event on the above date. Burton Leonard is also in the Club Championship. At the first running in 2014 Nidd Valley were victors but in 2015 they were swept aside by fantastic performances from all the Striders running. 2016 will be tough so lets put a date to dairies early. The bigger turn out the better. A few members I know already take part in this tough exhilarating discipline. Here are few early season events if you would like to have a go. 1. May 18th – Kildwick – 6 kilometres includes 245 metres ascent. Kildwick is between Keighley and Skipton. 3. June 1st – Otley Chevin – Start, just off town centre. 4.5 kilometres, climb 210 metres. Lovely low key event. 4. June 4th – Peny Ghent. Great run, just a bit of scrambling near the top, great downhill. 9.5 kilometres, climb 564 metres. Members I know who have ventured may enlighten you too, myself and Sue, Sean Brennan, Keith Emery, Dan Wilson and possibly the distance guys, Graham Yare and Dave Cremins. Have I missed anyone? Anyone thinking about this also read the Fell Runners Association website for further details of races noted here, other races, and the guidelines to adhere to (all commonsense) for doing fell running races. In the next fortnight leading up to the Club Time Trial on 29th March, could run leaders please show new members the route, mainly the 1st bit round the block. I know it will still be dark but walk or steady jog around would be a help. I will also display the route board a few club nights. I have been told this is the last revision of Summer Road League dates.